Israel's ambassador to the UN tells Security Council Iran spends $7 billion a year funding terror in the Middle East. On Tuesday, the United Nations Security Council held a special session on the Situation in the Middle East, focusing on Israel's actions in the region. 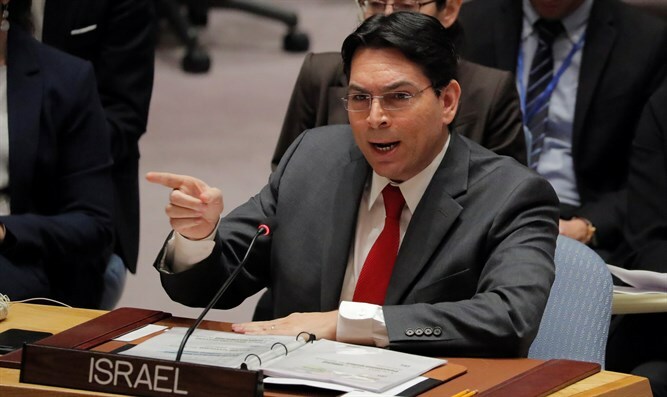 At the meeting, Israel's ambassador to the UN, Danny Danon, revealed to the Council members that Iran is trying to act against Israel from within Judea and Samaria, including its annual budget dedicated to operating a terrorist network throughout the Middle East. Danon addressed the Iranian missile fired at the Golan Heights from Syria, stating "Iran is exploiting the regime to conduct military operations against Israel, but we will respond with force and remove any threat to our people." Ambassador Danon revealed Iran's plan in Judea and Samaria, stating: "With the help of Saleh Al-Arouri, Hamas’s Deputy Political Chief, and Saeed Izadi, the head of the Palestinian branch of the Iranian Quds Force, Iran is trying to turn Judea and Samaria into a fourth military front against Israel. The world's silence allows Iran to continue with its operations and aggression to undermine stability in the Middle East." Danon called on the Security Council to recognize Hamas and Hezbollah as terrorist organizations and impose sanctions on them, adding that "weakening these terrorist organizations is the first step to dismantling the epicenter of terrorism that sits in Tehran."